For a change we're going to see a supermarket that doesn't have two more across the street. Of course, it's a matter of blocks from several more. 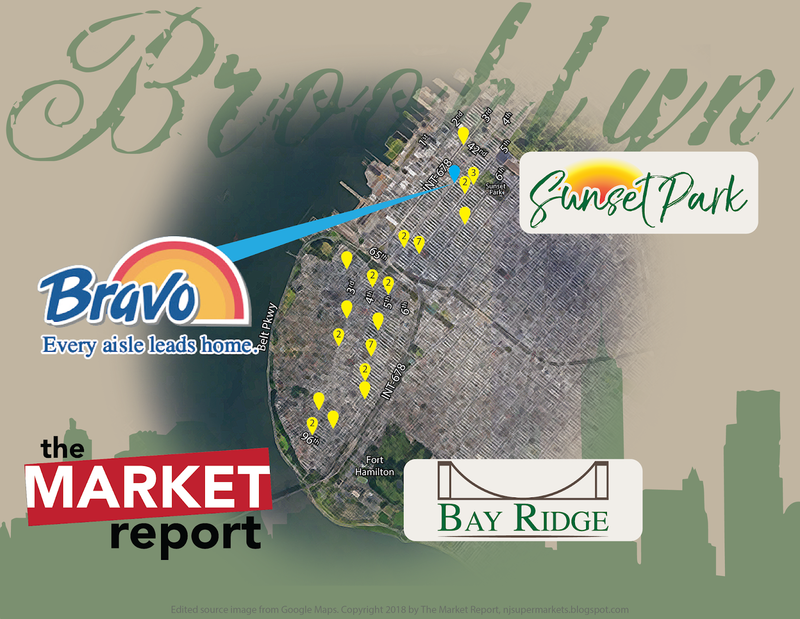 This Bravo Supermarket was probably opened around 2009. It was previously owned by another Krasdale-affiliated chain, National Supermarkets, whose only other location I can find was at 760 4th Ave, Brooklyn (now a CTown that opened in 2009), farther north in Sunset Park. Not quite national. Here's a look at the store and its surroundings. Once again, a mix of residential and commerical with a lot of pedestrian activity. The store's delivery van, complete with CTown branding and the address of the previously-mentioned CTown, was just backing in as I arrived, navigating around the double-parked truck and delivery truck parked in front of the fire hydrant. And people say New Yorkers don't follow traffic laws. The entrance, in case you couldn't read this subtle sign, is located on the left side of the store, with the exit on the right. Produce lines this left side wall with deli on the left as well. Meats continue along the back wall with frozen foods in an expansion to the left. Dairy is on the far side of the store. This Bravo tops out at five aisles. 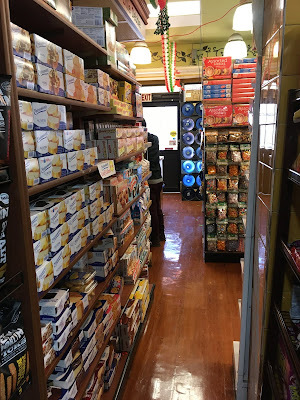 As with most New York supermarkets, it's not for the claustrophobic. However, the selection crammed into the small space they have is remarkable. A glance along the front end to the right when you enter. The customer service counter is visible just behind the column to the far left. The store continues to the back behind the produce aisle. The deli is located about midway through the first aisle, at the back of the produce department. Quite an extensive selection of fresh vegetables, which is of course what we want to see in every supermarket. We continue to the back in what I think is the first aisle. Here you can see that the store is relatively newly-renovated, but it's actually a little older than I thought. I would put the renovation at around 2005. More on that shortly. 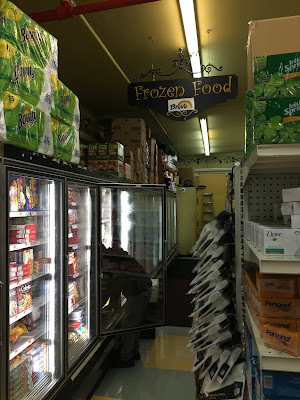 Bravo appears to actually extend behind its neighbor, The Wash Depot (which borrows The Home Depot's colors and font), with the frozen food section. At the end of the first aisle, you can make a left and continue walking beyond where the store ends in the front. Frozen foods are on the front wall of that section and meat runs along the back wall. This layout is very similar to the Pioneer Supermarket in Jersey City. Notice also that we've seen this decor before. Now for the back wall, seen to our right here. This section actually is almost identical to the Pioneer. Looking back to the main section of the store. I love these ornate hanging signs. I also like the effect of the green ceiling, which is still bright enough that the store doesn't look dingy. Closeup of the leaf pattern, a signature touch of DY Design. Cold cuts and meat continue along the back wall to the dairy aisle, which is visible ahead. 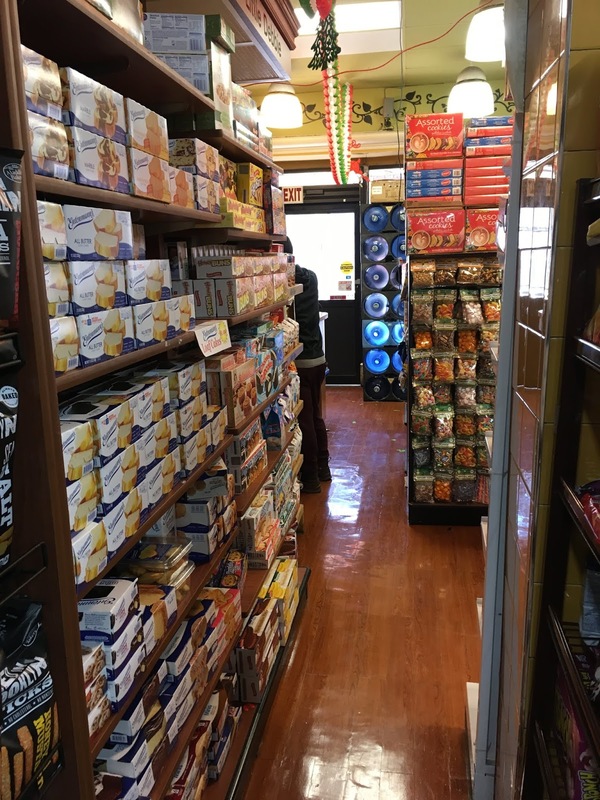 Small stores such as this one put paper goods on top of the perimeter cases to conserve valuable shelf space. Similarly, HABA items are typically placed behind customer service. Clean aisles with a few patched tiles, but that's OK.
You can't argue with the stock they have in this very small space. However, some of the spaces are very narrow. We've seen similar aisle markers before, such as these in Super Supermarket in Orange. Dairy continues along the last aisle. In this closeup of the Milk & Eggs sign, we can see (if you zoom in) that the Bravo logo is a sticker placed over the National Supermarkets logo. Although I know I've seen a picture of one of their stores with the National logo, I can't find it right now. The front end is not exactly spacious, but it gets the job done. Customer service is located behind register 3 here. Looking back up towards the entrance.